Jai Jester’s four consecutive free throws with under 50 seconds to play helped the Lakeside Vikings stave off a furious Chamblee Bulldog rally for a 64-59 victory in the country rivalry at Lakeside on Tuesday night. 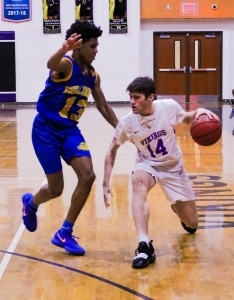 Lakeside (7-13) had lost a tough 51-49 decision to the Bulldogs (9-13) back on December 4th at Chamblee, but Joe Helenbrook’s fifth three-pointer of the night and a layup by Nate Kennedy had the Vikings looking for an easy win to even the season series leading 58-35 with 5:58 to play. The Bulldogs decided they weren’t going away easy putting together a 21-1 run to pull within 59-56 on Zachary Mackson’s two free throws with 1:05 to play. Eric Smith started the run by draining a three deep from the left wing with 5:40 to play and followed up a Mackson free throw with another long three to cut the lead to 58-42 at the 4:57 mark. Mackson, who scored 14 of his game-high 26 points in the fourth quarter, scored the next five points before Smith hit his third trey in a span of two minutes and 52 seconds to make it a single digit deficit with the Bulldogs trailing 58-50. Nate Kennedy went one for two at the free-throw line with 2:48 to play as the Vikings finally broke the 15-0 run by Chamblee. Mackson came on to hit four of six free throws to go with a layup to close the gap to 59-56 with 1:05 left in the game. Jester was fouled after the Bulldogs missed a three-pointer with 49.5 seconds and converted both ends of a one-plus the bonus to up the lead to 61-56. A charging call on the Bulldogs gave Lakeside the ball back and Jester was fouled again. He stepped up and converted another two free throws in a one-plus the bonus opportunity to make it 63-56 with 39.9 seconds to play. Smith hit another three-pointer, his fourth in the quarter, to cut it to a four-point game at 63-59 with 34 seconds remaining. Will Skuban hit one of two free throws to make the final of 64-59 as the Bulldogs could pull no closer. Joe Helenbrook finished with 19 points to lead the Vikings and Jai Jester who had three three-pointers of his won ended the game with 13 points. Mackson’s game-high 26 points led he Bulldogs while Eric Smith added 12 points and Rodney Smith 10. 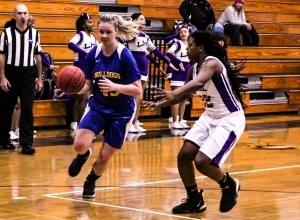 The Lakeside Lady Vikings hit six of 10 free throws in the final 1:12 of their rivalry game with the Chamblee Lady Bulldogs for a 44-37 victory to sweep the season series in the night’s opening game at Lakeside on Tuesday. Jasmine Redo’s layup on an assist by Sara Van Horn gave Lakeside a 38-28 lead with 4:27 to play in the game. Chamblee’s Trinity Edwards hit a three-pointer to start a 6-0 run to close the gap to 38-34. Edwards had a drive to the basket for another goal and Serena Robinson hit one of two free throws to cut the lead to four points with 1:12 to play. Olivia Cohen sank two free throws and Kiara Jackson hit one of two from the line to up the margin to seven (41-34) with 51.8 seconds to play. Robinson hit another free throw for Chamblee and Edwards sank two more to once again pull the Lady Bulldogs within four at 41-37 with 23.2 seconds left in the game. Cohen hit one of four at the line and Emyah Fortenberry’s two made free throws with a second to play sealed the 44-37 win. Kiara Jackson finished with a game-high 19 points and 14 rebounds to lead the Lady Vikings (15-5). Emyah Fortenberry hit for only four points, but collected 11 rebounds as the Lady Vikings out-rebounded Chamblee 47-28 in the game. Trinity Edwards hit for 18 points to lead Chamblee (5-14) and Serena Robinson finished with 13 points and 9 rebounds.